The camera market has self-saturated. There's so much good kit out there, capable of producing such high quality images, that product updates tend to focus on new features rather than significant core changes to sell themselves. In the case of the Panasonic Lumix G7, the successor to 2013's DSLR-a-like G6, it's all about 4K video. Well, sort of. Panasonic also utilises the 4K ultra-high resolution as a means to extrapolate still images to achieve those shots you might otherwise miss. It's possible to use the rear touchscreen to go through captured clips frame by frame and extract the best shot of the bunch (at 8-megapixels). Which is all well and good in theory, if that's a way you're willing to work. Otherwise the Lumix G7 condenses many of the top-tier GH4's features into a cheaper and noticeably more plasticky body. It's akin to a GH4 junior, or perhaps something like a GH40 namesake would have been more fitting. Given just how much we liked the GH4 is the Lumix G7 onto a winning formula, or does its presence feel unwarranted in such a busy camera market? We've been testing one for a number of weeks, both at home and abroad, to see how it fares. As much as we can cite the GH4 similarities, the G7 costs considerably less than its bigger brother, coming in with a body-only £599 price tag - which is less than half. Not a bad start for those seeking affordable. However, that cut can be clearly seen and felt in the product's design. It's an altogether boxier and more plastic arrangement that, while it doesn't look bad, really isn't a patch on the top-spec model. It looks as though Panasonic has taken on board the current Olympus and Fujifilm retro design trends in the G7, but minus the same level of sophistication. There are small design points around the camera - such as the SD card slot being lumped in with the battery and the plastic finish of the top dials - that lack the high-end feel. But, equally, with the likes of an autofocus selector and no less than six physical function (Fn) buttons there are heaps of pathways into the controls, further supported by a touchscreen for added simplicity. The only oddity, perhaps, is the sixth unmarked function button mounted in the centre of the rear thumbwheel, which feels impractical to press when holding the camera up to the eye. By default this doubles-up the thumbwheels' controls - front for white balance and rear for ISO, instead of the typical aperture and shutter speed controls - in a similar manner to the 2x2 level found in some of the Olympus OM-D range. Only with the Panasonic G7 there are already dedicated WB and ISO markings on the four-way d-pad, so this feature doesn't feel as natural or necessary as it could have. The arrangement of so many controls gives the G7 a DSLR-like feel, just like the previous G6 model in the series did, albeit on a yet larger scale. There's a new protruding grip showing that Panasonic isn't afraid to opt for a larger scale for the sake of sensible use. We've seen dinkier G-series cameras before, but the likes of the Lumix GM5 are for a different audience - and not the mid-level DSLR market that Panasonic is targeting with the G7. Although technically no current G-series is a DSLR, because there's no mirror box, this compact system camera comes from the Micro Four Thirds stock - which is great when it comes to choosing lenses. Both Panasonic and Olympus make MFT optics ranging from budget through to professional depending on what you're looking for. This compact system camera genetic makeup also ensures functionality is just the same whether you use the electronic viewfinder to the rear or the vari-angle LCD touchscreen. There's no dip in performance whichever you choose, with an automated sensor kicking the viewfinder into play as required (this can be switched off if preferred via Fn5), but we've been using the screen twisted into all manner of positions the most. Whichever method you choose there's no corner-cutting at this price point. The 3-inch LCD has a 1,040k-dot display, which is a solid resolution, while the 2.36-million dot OLED panel used in the viewfinder (which has 0.7x magnification for scale) is about as good as it gets. Only in low-light might you spot some ghosting if moving the finder rapidly. But it's the vari-angle nature of the screen that we've found an increasingly essential feature. Having used the GH4 for a number of months for personal projects, every time we head back to a fixed-screen DSLR we feel a little lost when it comes to ground- or waist-level shots - which we do a whole lot more than you might assume. Autofocus is another clear positive, plucking the staple features we like about the GH4 into this more affordable package. Panasonic has reached a point where it's AF systems are so fast we don't think we'd even spot improvements, it's really that fast. A half press of the shutter seems to instantly obtain focus with a gratifying "beep" and green focus area on screen. Or if, like us, silence is important the beep can be deactivated. It's not all about speed, of course, with accuracy of key importance too. For the most part this is spot on, especially when using the Pinpoint AF mode, with only a few exceptions messing with the AF's decision making - sometimes resulting in totally out-of-focus shots (usually based on reflections fooling the camera), other times missing the critical depth of focus which only becomes apparent when looking back over images at greater scale. But as can be seen from our sample gallery, we've successfully shot a bumble bee pollinating flowers and while not every single frame was perfect, using the 8fps burst mode (it's slower than the GH4's 12fps) to reel off a batch of shots helped. Or we could have possibly used the 4K Photo mode here - more on that later. Low-light fares well too, pulling the same -4EV sensitivity as found in the GH4. Few other cameras on the market are sensitive to such a degree, which makes light work of snapping dim subjects without flash. We've shot chandeliers, dim rooms at night, and all with largely proficient autofocus feedback - not the generalised “think it's in focus” confirmation of some competitors (although this will happen when it gets too dark). Autofocus options come in a variety of modes: face/eye detection; tracking; 49-area auto; custom multi which offers multiple user-selected points to be activated; 1-area; and pinpoint. Coupled with the touchscreen it's possible to tap-to-focus anywhere on the screen, which is great, although it's all too easy to move the focus point by accident when adjusting the vari-angle screen's position. Pinpoint is our favourite AF option; a cross-hair focus area will zoom into 100 per cent scale with a half depression of the shutter button to ensure, as the name suggests, pinpoint focus is acquired. It's a little less quick than 1-area, but for the majority it's worth the added assurance. And, for now, Panasonic is the only company to offer such a mode. We'd call it 99 per cent accurate, undeniably fast and, in short, the G7 performs well beyond its price point. Now Panasonic thinks its 4K Photo mode is going to be the next big deal. We're unconvinced by the name's misdirection, as all the camera is doing is shooting a 4K MP4 clip. It's in-camera software that then makes it possible to thumb through that 30fps clip frame-by-frame and select a shot to pull out as an 8-megapixel image. That on board software works pretty well though, thanks to the touchscreen controls and speed at which everything works, but if you wish to extract a still when not using the camera's interface then it's altogether more laborious. In Photoshop it's possible to load a 4K MP4 clip into a timeline and select the desired frame, but even a reasonably proficient machine - we've been using a MacBook Air in this instance - won't be able to churn through everything in real-time. Where 4K Photo particularly shows its worth is with its Nikon-J-series-esque pre-burst mode, which shoots a second of footage before pressing the shutter and a second of footage after. The camera is always thinking, binning the shots in the buffer right up until that critical shutter press, which is ideal for not missing the moment. Well, sort of. The viewfinder/screen blacks-out when the shutter is pressed, so you'll feel detached from the action unfolding and the processing means you can't immediately shoot a second pre-burst. The mode still needs some fine tuning in our view too: as autofocus can't be acquired via a half press of the shutter, out-of-focus shots aren't uncommon. So sometimes we suspect 4K Photo will come in handy, particularly as non-stop capture at 30fps for up to 30-minutes is possible, but we're not sure it's the immediate go-to mode for all things. The name's kind of confusing for starters (a 16-megapixel sensor capturing 8-megapixel images, packaged as "4K Photo", but with a video file as the end result); no raw files possible; more compression per frame than a Fine JPEG; oh, and continuous autofocus still isn't perfect and can lose focus of the subject sometimes. For us we're content shooting raw & JPEG full size stills, with 4K Photo available as a backup for specific situations. But it's another tool in the box to have in reserve, which is no bad thing. For 4K video, however, the Lumix G7 is mighty impressive at this level. It's got most of the GH4's smarts, lacking only the highest-end Cinema mode (meaning no ultra-wide 4096 x 2160 24p is available). Instead it can capture 3840 x 2160 4K at 24/25/30fps with a 100Mbps maximum in MP4 mode. Dip to 28Mbps and that frame rate doubles to 50/60p. There are other high-end video features too, from continuous, full-time and manual autofocus, through to a 3.5mm microphone jack for audio recording. Focus peaking, zebra pattern, display markers and even a tele converter (which utilises the exact 3840 x 2160 portion of the sensor, effectively doubling the equivalent focal length for 4K) are all within the menus too. There's stacks of control for amateur or even pro, the results are rich with detail and the G7 really shows its video capture worth. It's all too easy to get swept up in the hype of new modes, but the Lumix G7 is a stills camera at its core. And a really rather good one at that. The sensor on board is the same stock one as found in the Lumix GF7, with a few tweaks to help achieve even better results. Throughout the ISO 200 - 25,600 sensitivity range we've been impressed with the richness of blacks, remaining uniform even in dim conditions where some image noise begins to deteriorate image quality. It's a shame there's no option for ISO 100, but with an electronic shutter option meaning shooting is possible up to 1/16,000th sec it's possible to negate bright light at this base level sensitivity if needed all from within the camera. And ISO 200 looks quality: we've shot a synagogue rich with detailed characters on its exterior; floral heather at f/2.8 with great bokeh; even Audi RS3 Sportbacks lined-up outside a plush manor house. Zero complaints in detail here, the results are resounding. Move up the range and the detail largely remains, although the JPEG files do soften a lot of the premier detail that's available in the raw equivalents. A candle shot at the side of a bar, for example, gives a more smoothed appearance at ISO 400 compared to the uniform crispness of the raw equivalent. The detail's still there in the right places though, thanks to Panasonic's zone-based processing, which intelligently reads the image. Even when pushing into ISO 1600 there's little colour noise to worry about, which is a result from a sensor of this size. There's a whisper of it, but not to the point that's disruptive and, as we mentioned, shadow details remain strong. It's the upper echelons of the range that are best avoided, with ISO 25,600 a little far fetched. It's not a total write-off, though, but we capped our Auto ISO maximum to the ISO 6400 mark to maintain greatest quality. 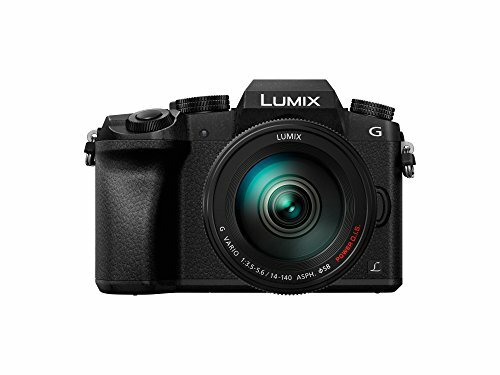 Just because it's got a smaller sensor than a number of competitors doesn't cost the Lumix G7 as much as you might think. Its images are strong enough to stand against the competition, while the process of getting there is helped along by strong performance. Technically there are cameras that can produce better results, but the differences are subtle in the main and plenty of the competition fail to deliver as strong in the performance stakes. So there we have it, the GH4 junior. No, we mean Lumix G7. Just like the top-end model, the G7 offers great image quality, excellent 4K video capture, super-fast autofocus, and even the 4K Photo option has its uses. The biggest drawback in the G7 is its build. It’s boxy, plasticky and, despite the positive of a larger grip than the G6, it’s an even larger design this time around. But for this price point, and considering how much cheaper it is than the GH4, it’s hard to complain. So does it earn its place in the Lumix G line-up? Its new features might not be particularly stand-out, but in terms of logical progression the G7 feels like a sensible re-rub of its predecessor. If it cost more money we’re not sure it’d warrant existence, but at this price, with these features on offer, it’s hard to shoot the G7 down. We’ve previously concluded that the DSLR vs mirrorless gap has closed, with the Lumix G7 further cementing that argument. Plenty of competitors can’t muster a feature set as full as the G7, but Panasonic makes it look easy.